For all your catsup, mustard and relish needs! Custom designs also available. CLICK IMAGE TO ENLARGE. Description Countertop Dual Large Pump-Style Bottle Condiment Organizer, this item is ideal for convenience stores, stadium concession stands, hot dog carts, or anywhere that sells hot dogs. 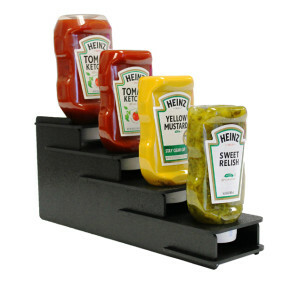 This condiment organizer is made of durable black ABS plastic and can accommodate two # 9 or #10 large pump-style condiment dispensers. 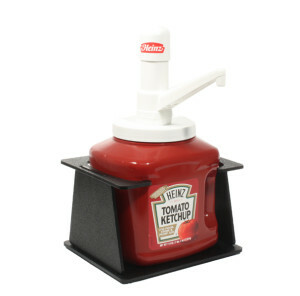 Condiments and pumps sold separately. 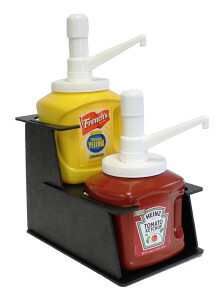 Description Countertop Large Pump-Style Bottle Condiment Organizer, This item is ideal for convenience stores, stadium concession stands, hot dog carts, or anywhere that sells hot dogs. This condiment organizer is made of durable black ABS plastic and can accommodate one # 9 or #10 large pump-style condiment dispenser. 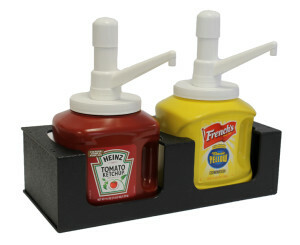 Condiments and pumps sold separately. 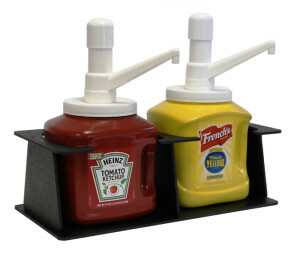 Description These stair stepped units hold 4 inverted condiment bottles. Keeps bottles secured and neatly organized! Great for any counter top application!